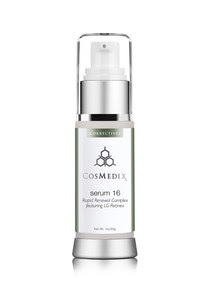 Cosmedix has came out with a new anti aging serum called"Serum 16" A dual retinol rapid renewal compex, this will reverse the signs of aging. WHAT IT IS: The latest encapsulated dual retinol technology from CosMedix In the industry’s first dual retinol anti-aging serum, Serum 16 by CosMedix introduces the most advanced encapsulated delivery system available: LG Retinex. This proprietary technology is proven to deliver higher potency and enhanced efficacy for noticeable skin results. HOW IT WORKS: LG Retinex uses “intelligent encapsulation” that not only protects ingredients for maximum long-term potency and effectiveness, but also tells the skin to act younger through a supercharged combination of retinol and retinal—creating the most potent form of vitamin A available without a prescription. Retinol and retinal are the golden standards in stimulating the fibroblasts, the cells responsible for the production and synthesis of collagen. These two retinoids play a key role in stimulating and accelerating exfoliation and promoting the cell renewal and rejuvenation. 2.Supercharged transport system. Using the best liposomal delivery system available, coupled with glycosaminoglycans to aid in membrane delivery, LG Retinex delivers actives deep into the skin where aging occurs. CLINICAL RESULTS: In a six-week clinical trial, Serum 16 visibly reduced the appearance of deep lines, including crow’s feet. Within about a week and a half I noticed my skin was looking brighter and more alive. I have yet to notice my crow's feet lines fading, but I think with continued time they will start to dimnish. Cosmedix Serum 16 sells for $78 on the Cosmedix website. Been using this for a week. I am breaking out. 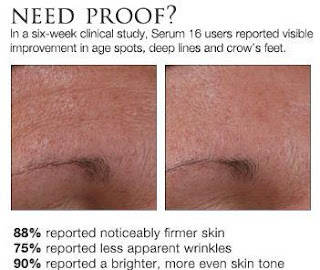 I wonder if its the serum doing this or what? Didn't have this before. Anyone else?